clear rats from my home and garden. Ivy quickly becomes one of the biggest garden pests of all, choking out native plants, ruining trees, damaging windows and even our roofs and guttering, any small gap it can get its tendrils into will eventually be damaged. Dense ivy ground cover forms a shelter for rats is slug heaven and the dust it collects can cause breathing problems for those with allergies, on this page how to get rid of ivy. Is Ivy growing on walls, stonework or trees a problem? Ivy ground cover smothers native plants, preventing sunlight from reaching leaves. Ivy growing on trees can cover branches, preventing new buds eventually killing them. Its leaves prevent any light from reaching the tree bark preventing activation of any dormant buds. The pure weight and mass of mature ivy can make trees blow-over in high winds. Ivy creeps into neighbouring gardens, your home, your roof and blocks guttering. Ivy can transmit bacterial leaf scorch, which threatens native elms, oaks and maples. Ivy does not stabilise sloped gardens because its roots are shallow, it actually makes the problem worse, because it smothers other deep rooted plants that would stabilise the slope. 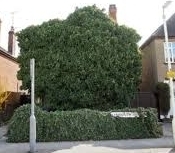 If your neighbour neglects the garden, It is almost impossible to stop ivy creeping over, under and through neighbouring fences and walls, You could try asking your neighbours to control it, but it is probably easier to check now and again and destroy it yourself. All those old English houses that have been standing for centuries are mostly held together by ivy. Ivy does not cause mortar to crumble or harm fired clay bricks. Ivy provides a natural habitat and food for birds and wildlife in your garden. It is a cheap and attractive way of covering up an unsightly wall. tips to clear Ivy from trees, brickwork, stone walls, fencing and ground Ivy. Ivy produces seeds when it climbs, so before clearing ground cover ivy, kill the ivy growing up trees and garden fences. Start by cutting the ivy vines around the whole tree trunk about 1ft above the ground. Leave the ivy above the cut to die in the tree. Ivy leaves can take several weeks to die off. and will stay green for several weeks after cutting. Clear all ivy vines out about two feet from the base trees. If any of the vines are too thick or difficult to dig or pull out of the ground, (on stony ground it's almost impossible to dig or pull out ivy roots), treat the cut vine immediately after cutting with a glyphosate based weed-killer, being careful not to spray any plants you want to keep. Now the back breaking work, pull or dig up the remaining untreated ivy from the ground. If you have a large area it might be a good Ideal to dig up the plants you want to keep and then cut or break off the ivy vines, leaving about a foot of vine with leaves, above the ground and treat the whole area with glyphosate. and dilute it with water myself. Always read the instructions. Removing Ivy from your garden fence. Ivy is best removed from fencing before it has taken hold, pull it out by the roots or treat it with glyphosate as soon as you see it. Once it has forced its vines through and around lap or feather edge fencing panels, it's almost impossible to remove it without damaging the fence, in fact it's probably holding the fence together. Try cutting through the vine about 12inches above the ground and treating the freshly cut vine with glyphosate weed-killer, this will kill the ivy, stopping it from doing more damage to your fence. The bushy ivy will die off, making it easier to see if it can be untangled from the fence. If the ivy is growing from your neighbours side of the fence, email a copy of this page to them. To dispose of the cut ivy the best way is to burn it or it can be left on a ground sheet in a loose dry heap to die off. Check your contractor is not going to shift your problem to someone else by dumping it in a field somewhere . Small amounts can be tied in a bin bag to rot and then added to your compost heap. Never add living green ivy to your compost heap. Eradicating Ivy from your garden. Generally it is very difficult to kill an entire ivy plant with the first application of herbicide or by digging/pulling ivy roots out. You will almost certainly have to selective spray or dig now and again over the coming months to eradicate the Ivy pest completely. Even when you think you have won the battle, a bird will dump a Ivy seed smack bang right in the middle of your garden. A new shoot will appear over your neighbours wall or under the boundary fence. Keep on top of it. Clearing Ivy from brickwork, brick walls and stone walls. Ivy growing over your home can look good but if it creeps into chimneys, widow frames, guttering, roof tiles and under fascias it can be a problem and very difficult and costly to remove especially from a building with two or more stories. Again, there is not a quick n' easy way to remove Ivy from brickwork or gardens but these DIY tips may help. It is quicker and easier to remove living ivy, its also easier when damp, the vines are more pliable, making it easier to get your fingers or tools behind the vines. Pull or lever the ivy away from the wall, starting from the highest growth and working down. If there are several vines growing up the wall, work from one side until you have removed all the ivy from the brickwork. The tendrils (ivy feet), the hairy bits that get into the crevices and help the ivy to hold onto the brickwork will be hard to remove. You can pry these off with a putty knife. Normally these feet will dry up and disappear. If they continue to grow you will need to chemically treat them. I wish there was a "greener way" but I haven't found one yet. You will need to be careful when pulling the ivy away and scraping the tendrils from the brickwork as brick and mortar can be chipped off or break away. It may be safer to cut the ivy away with shears. If the ivy has been growing on the brickwork for years, the evidence that it has been there will take a few years to completely disappear. If the ivy root is not growing from the foundations, through concrete or your patio, dig the root out. If you can't get to the ivy root, chop the ivy down as close to the root as possible. Don't add Ivy to your garden compost heap until its completely rotted, tips on rotting ivy and bindweed down can be found on my gardening tipspage. Spray any remaining roots with a Glyphosate based weed killer. This will need to be done every now and then until the ivy gives up and dies. If the Ivy roots are growing in a neighbours garden, there's not a lot you can do but keep trimming it back, unless they agree to you removing or treating the roots. If you are planning to remove ivy yourself from high up hire a cherry picker. If you cant get a cherry picker in make sure you have got someone, who likes you, holding onto the ladder. The best and quickest way and the cheapest weed-killer for clearing Ivy. Super concentrated (360g/l) and the best value glyphosate weed killer that kills the whole plant and the roots. A lot cheaper than premixes. 12 ml per litre is all that's required for something like a sprayer. and 60ml in 5 litres will kill 100s of sq metres.. Weeds should start to die back in 1-2 weeks. One Litre Treats Over 0.4 of an Acre Offering the Best Value Available. If you are killing and clearing a large area of Bramble, Ivy, Bindweed, Japanese Knotweed, Horsetail and Dandelion or weeds keep shooting up from under you neighbours fence, I would advice using concentrated glyphosate, rather than the sprays. I do a lot of weed clearance and this works out a lot cheaper than using the Round Up type weed killers You will get excellent results on all broad leaf weeds by just following the advice on the label, however I do increase the dosage to 50ml to 1 litre of water for bramble growth.. Always read the label and product information this is a professional pesticide product. Always check Strength actually is 360g/l when buying concentrated Glyphosate weed-killer from other sources.